Dagenais, Maxime. "The Quebec Mercury". The Canadian Encyclopedia, 03 August 2017, Historica Canada. https://www.thecanadianencyclopedia.ca/en/article/the-quebec-mercury. Accessed 21 April 2019. The Quebec Mercury was a weekly English-language newspaper published in Québec City from 1805 to 1903. The opposite of the famous French-language newspaper Le Canadien, the Quebec Mercury represented and defended the political and economic interests of the British mercantile elite (the Château Clique). 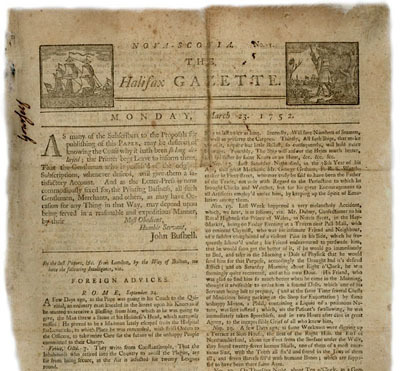 The newspaper opposed all reform that would give more authority to the French Canadian-dominated Legislative Assembly. It also promoted the political marginalization of French Canada, and sought to strengthen the colony’s ties with Great Britain. Throughout most of its existence, the newspaper was owned by the Cary family, a famous family of newspaper moguls. In 1863, the newspaper was renamed the Quebec Daily Mercury. It was shut down in 1903. 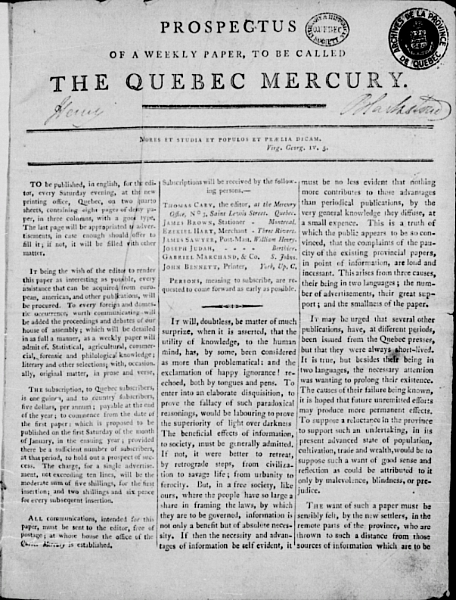 The first issue of The Quebec Mercury, published Saturday, 5 January 1805 in Québec City. In the decades that followed the Constitutional Act of 1791, a struggle developed in Lower Canada that eventually led to armed insurrection (see Rebellion in Lower Canada). Inspired by the rise of liberalism and nationalism that swept the Atlantic world at the turn of the 19th century, French Canadians sought greater authority and control over their colony. Leading this charge, the Parti canadien and its mouthpiece — ​Le Canadien — pushed for a governor general and executive and legislative councils that were accountable to the elected Legislative Assembly (see Responsible Government). Standing against them, the British mercantile elite (also known as the Château Clique, the British Party or the Tories) opposed any reform that would give the French Canadian-dominated Legislative Assembly more political authority. Prospectus of a weekly paper, to be called the Quebec Mercury, published 19 November 1804. 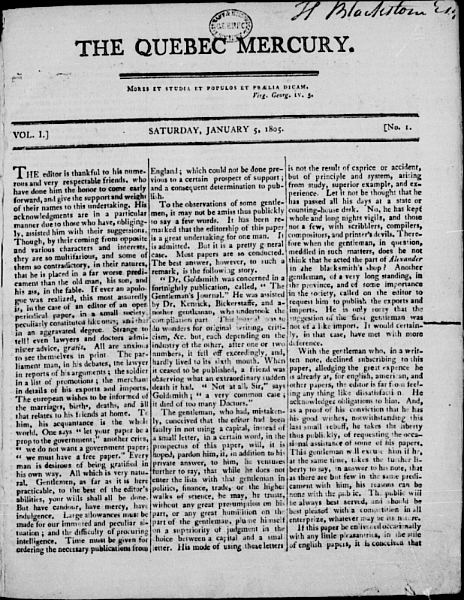 First edition of the Quebec Mercury, published Saturday 5 January 1805. 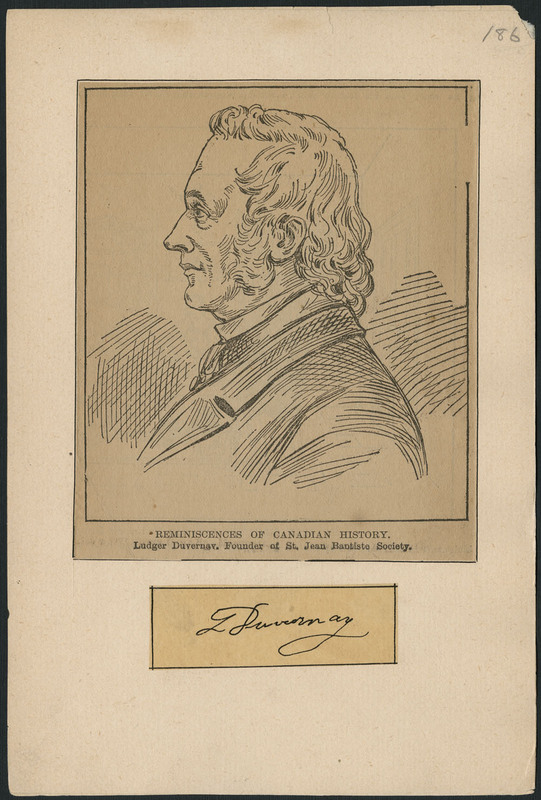 The newspaper’s anti-French Canadian editorials resulted in condemnations from ​Le Canadien, which supported political reform and defended French Canadian interests. In the decades that followed, both newspapers heavily debated and condemned each other’s perspectives. In 1819, Thomas Cary Sr. handed control of the newspaper to his son, Thomas Cary Jr., who remained editor until 1855. In 1831, the newspaper turned from a biweekly to a triweekly newspaper. Cary Jr. also maintained his father’s editorial stance; however, his position towards French Canadians was much more moderate. This was likely due to the fact that between 1828 and 1848, the newspaper was co-owned by George-Paschal Desbarats, a French Canadian printer and businessman from Québec City. Thomas Cary Jr. remained editor of the newspaper until 1855, when his son, George Thomas Cary, took over. In the decades following the rebellions, the newspaper continued to promote Tory interests. The newspaper’s editorial position was especially shaped by its new political editor, John Henry Willan, who remained in this position from 1850 to 1862. In the early 1850s, for instance, he used the pages of the newspaper to support the efforts of the Annexation Association, a group of English-speaking businessmen and French Canadian radicals (the latter known as the Rouges)who believed that Canada should join the United States. The newspaper again debated Le Canadien, which opposed the group’s aims. Willan left the newspaper in 1862 when it was leased, for two years, to Josiah Blackburn, the owner of the London Free Press and Daily Western Advertiser. Blackburn used the Mercury to support the Liberal Macdonald-Sicotte government (1862–63) in Canada East. He severed his ties with the newspaper in 1864 after the resignation of the Macdonald-Dorion government (1863–64). During his time at the newspaper, Blackburn turned the Mercury into a daily and, on 10 January 1863, officially renamed it the Quebec Daily Mercury. In 1864, Willan returned to the newspaper. Willan continued to support Tory policies, writing in favour of Confederation. Until it closed in 1903, the newspaper remained a supporter of the Tories. Ironically, Joseph-Israël Tarte — editor of Le Canadien, the Mercury’s long-time opponent — acted as publisher of the Mercury for a short time in the newspaper’s final years. QUEBEC MERCURYRead the pages of the Quebec Mercury (1804–1903) at Bibliothèque et Archives Nationales du Québec.